Foodies always wondered what London broil is? It looks like beef meat but doesn’t taste like beef! What is this actually? London broil is a STYLE of cooking a particular part of beef. And you know what, lots of people love beef. According to a report from the National Beef Association, people spent about £3,136 million on beef in 2015. The average consumption rate is about 18.4kg of beef per person. Further, this amount increases up +2.6% only after a single year. So, you can easily imagine the popularity of beef! It is the regular requirement of beef. But the chefs are making lots of foods by modifying the beef. London broil is one of the most items among them. London broil is a method of cooking a steak. This name became synonymous with a cut of meat. In early restaurants of the United States, London broil was one of the first recipes to become popular. Though the particular origin of London broil is lost to history, James Bread believed that this dish started in Philadelphia. Okay, now it’s time to know from the different countries. In Canada, London broil is known as a ground meat patty. It can be wrapped in flank or round steak or not. In North America London broil is marinated, grilled, thinly sliced and of course, a reasonable cut of beef. In the English town of London, the dish is unknown. In general, the meat is a tricky and affordable cut. Cooking London broil is not rocket science. With some simple techniques and common tools, you can provide a tasty meal for your family. Everything is fine till now. But the problem began when you have to sacrifice an important tool. To be more specific, I am talking about the broiler pan. Well, a broiler pan must be a helpful product for your cooking. It removes a few hassles for you. But you might not get a broiler pan every time in your kitchen. It may happen that your existing broiler pan is already booked or might be you don’t even have a single piece of the pan. Further, whenever you are going to follow a recipe to cook London broil, the recipe may suggest you use a broiler pan. So, what should you do? Do you buy a broiler pan now? The cooking tool is not that much important here. Just focus on giving your London broil a good sear and seasoning. Don’t get panicked about the cooking utensils, pay your full attention to the cooking process. You may wonder that how to cook London broil in the oven without broiler pan? Well, there are hundreds of ways to cook London broil without any kind of broiler pan. 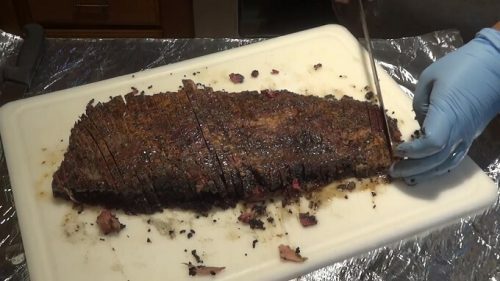 In the following section, I am going to inform you about a mouthwatering recipe to cook London broil in your own kitchen with your oven without any broiler pan. At first heat your frying pan and oven. Set the temperature wisely. The safe choice is medium-high heat. Don’t make them over-heated. It will cause a problem on further tasks. Even if you over-heated your pan or oven, don’t panic about that. Just keep them idle for a few minutes. It will get the previous state within a little time. While waiting for the pan to get their plenteous heat, you should not sit idle. You can start working with the ingredients. Now apply pepper and salt and perform your favorite seasoning to both sides of the meat. You can do it also using a meat injector. You may include a little spice on your seasoning. It will provide a different flavor to your meat. If you are out of spice, curry powder also works great. Now put a tablespoon of oil in the frying pan and heat it. You should heat it continuously until the oil is heated enough. There is a very easy procedure to check the heat of the oil. Just moisten your finger with little water and flick a small amount of water in the pan. If the water splatters instantly, that means the pan and oil is heated enough to cook. You should do it after few moments repeatedly to avoid over-heating. You can also check the heat by using a wooden stick. If you see small bubbles around the stick, then it is ready. Otherwise, it needs more heat. When the pan and oil are heated perfectly, put your steak in the pan. Now cauterize it on both sides. Leave the steak in the frying pan to cauterize it properly. Now put the whole thing in the oven. Try to put the pan closer to the heating element. It reduces the required time to cook your London broil. However, you should keep an army-attention on the oven to prevent the burning of your steak. Take your meat out of the oven 5 degrees before it reaches to the desired internal temperature to get the better result. The United States Department of Agriculture (USDA) recommends applying 145 degrees F in the oven. However, this temperature depends on the thickness of your steak. But you have to keep it inside the oven about 3 to 5 minutes per side. Now it’s high time to remove the steak from the frying pan. To stay on the safe side, you may remove the pan a little earlier before it is heated with 145 degrees F.
Now add one and a half cup of chicken stock, beer or wine on your steak. It will make a simple pan sauce. You may also add a tablespoon of butter on the sauce. To get a better taste, you may season with salt. But if you use the wrong amount of salt, your London broil may become salty, and all of your efforts will end in smoke. However, a perfect amount of salt can make your steak literally mouthwatering. Unless you want to risk your London broil with the salt, you have to follow an extra step to make it tastier. Collect some onion and garlic powder. Now do a simple seasoning with onion and garlic powder. Do it for a few minutes. So, the overall process is done here. Now it’s time to peel the browned meat pieces and serve your steak with sauces. Use slicing brisket knife for that. Don’t forget to give us your valuable feedback about the taste of your London broil! Do not overfill your fry pan. It may decrease the temperature of the pan. Sear the steak over high heat. Allow the steak to rest 5-10 minutes (if you can, allow it to cool completely) before slicing it. What are the alternative utensils to use for London broils? Well, you can see that we have used a frying pan instead of broiler pan. It is completely good to make London broil tastier to eat. But we have already mentioned that the cooking tool is not that important. You can use any of that tool to cook your London broil. Here we have listed some alternative utensils that you may use instead of frying pan or broiler pan. Regular pans are safe for low heat. If you are going to bake the meat at a low temperature, then it is best to use a regular pan. But make sure the steak is in room temperature while it hits on the hot pan. The cooking process and temperature have a great effect on a regular pan. You should use a regular pan only if you use a lower temperature. Point to be noted, if you cook your London broil slowly with lower heat, it will be tastier. It is a low-cost tool. You can use it for different purposes. For example, you can bolt meat dry by a paper towel before pan-fry it. You will get a flavorful crust once it hits your hot pan. The oven grill rack is one of the best alternatives to cook London broil. The oven grill rack has multiple features. It is useful not only for the cooking London broil, but also it is handy for performing some basic kitchen tasks. It will shorten your cooking time with excellent performance. Few modern oven grill rack also comes with built-in pipe looks funnel. It helps to send the smokes and fumes out of your kitchen. It is the simplest option for baking up London broil. Meat tongs will give you the same feel as a broiler. So, if you are a broiler fan, you can use the meat tongs. Looking for the safe temperature during baking? Well! It is the best option for you. And for the perfect temperature, your steak will give you the right texture and taste. So, this is a list of alternate utensils that you may use for London broils. Here we have discussed the uses of each of those utensils. Just pick the best one according to your task! London broil is a highly economical, nutritious, flavorful, and easier to cook food ever. It is a great source of vitamin, mineral, and protein. 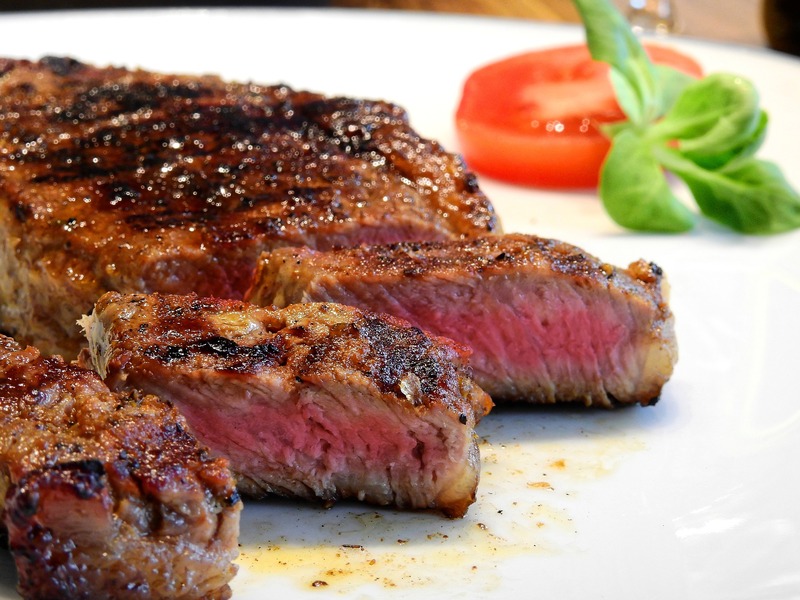 The Harvard School of Public Health recommends consuming at least 3 ounces of red meat per week. It reduces the possibility of premature death. Isn’t it amazing? Do you know, London broil plays a vital role in the development and maintenance of your neurological system? That’s because London broil has huge vitamins and minerals in it. Here is another thing. But before this, let’s know something about diet. Diets that do not include sufficient amounts of zinc may be linked to the risk of nervous system disorders. London broil is the primary source of dietary zinc for Americans. Each 3-ounce serving provides 39 percent of zinc’s RDA. Beef contains vitamin B-6 and vitamin B-12. These two vitamins are responsible for promoting nervous system health. London broil has the high concentration of vitamin B. This helps support higher-level thinking and long and short-term memory. Protein is a front-line element for every dieter. Because a report published in the “Journal of Nutrition” in 2005 stated that, consuming protein regularly can reduce overall body fat and lean muscle mass volume significantly. However, you have to continue a consistent exercise along with consuming protein. 3 ounces of London broil contains 27 grams of protein. It is half of USDA’s recommended daily protein needs for a healthy adult. So, consume only 3 ounces of London broil, and you are free from overweight. Cholesterol and LDL is one of the main reasons for most of the heart disease. In 2011, a study showed that London broil could lower the cholesterol and LDL level of our body. It decreases the risk of heart disease. London broil also contains a huge amount of selenium. It is a mineral that acts as an antioxidant. It helps to prevent the damage of cellular tissue and DNA. Iron is essential to work the immune system properly. And London broil contains about 14 percent of iron’s RDA. Though leafy vegetables and green plants are rich in iron, the animal iron is also effective for health. Along with the iron, London broil also contains Zinc and Vitamin B. these elements also contribute to increasing the efficiency of our immune system and wound healing. London broil is not just average food. It is something that you cannot ignore once you start to consume it. Further, the nutrition value and other health benefits of it make it an essential element of my everyday meal. What’s your favorite way to cook London broil? Let us know via the comment box! I don’t have a meat temperature probe. It won’t be possible to make london broil? It is not necessary. But if you have it then you will find ease at cooking the london broil. Is there any alternative if I don’t have wine and the taste will be perfect? I think to get the best of London broil you must use wine. In case you haven’t got the wine you can use a little amount of olive oil instead of it. I am a really big fan of london broil. Due to its health benefits, I always prefer this recipe over many others. Thanks, Monique for sharing this in detail. Thank you for your opinion, Steve.